We have a few updates below, especially following the launch of the Catapult Roadmap. We have officially launched a high-level roadmap for Catapult available here. NEM Foundation will be engaging with the media and partners to communicate this message. We are also inviting the community to provide continuous input via the forum and will be working progressively on the work we have been doing in developing supporting applications for the launch of Catapult. Version 2.4.4 of the NEM Wallet has upgraded its Voting Center to make for an improved voting experience on the Mainnet stemming from problems in the center during the last election. 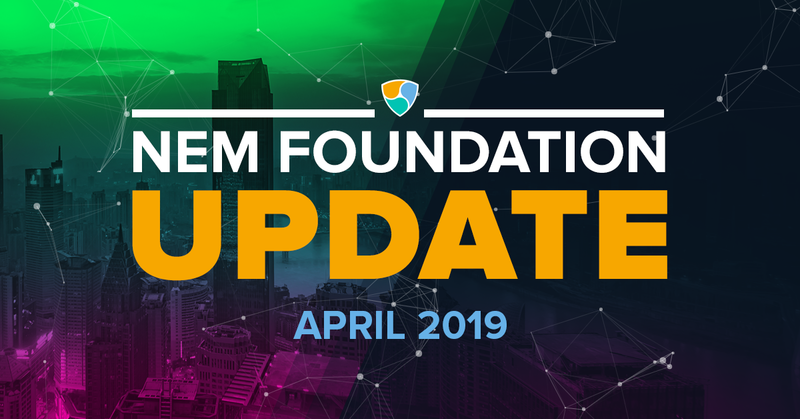 With the establishment of NEM Ventures and the vetting of all community fund projects by the Ventures team, the NEM Community Fund announced that it is stopping distribution of funds. NEM Foundation respects this difficult decision and expresses our support for all ecosystem members. Please note, the NEM Foundation operates as a separate entity from the NEM Community Fund and works with all contributors to the NEM ecosystem. Nelson Valero has resigned as Vice President and Executive Committee (ExCo) of NEM.io Foundation. We value Nelson’s contribution to the growth of our network across multiple regions. We will work with Nelson on a transition process in the next few weeks and will be making an announcement at a later date to fill leadership positions for the future. Grégory Saive comes onboard as Head Developer for NEM Foundation after 5 years working in distributed ledger software development of which the recent 3 years was with the NEM blockchain technology. He had contributed to the development of PacNEM, SDKs for NEM and other cryptocurrency related projects (github). In the last 2 years, Greg had worked with many companies and been a Speaker about DLT and had been an author for various printed magazines in Germany. He will be working with interim CTO Jeff McDonald in contributing to the launch of Catapult as part of the NEM Foundation team. There were a few speaking engagements by the leadership team with Alexandra Tinsman speaking at a panel on ‘The next 10 years’ during SXSW in Austin, Texas (where she was also given a community-nominated award as an inspirational woman leader in tech.) Jeff McDonald was at Money 20/20 Asia. Jason Lee moderated a panel on ‘Risk & Security in Blockchain and DLTs’ at the Australian Davos Connection (ADC) Forum during the Global Blockchain Summit in Adelaide, Australia. He was also speaking in a panel on ‘Blockchain in Health’ as part of a healthcare working group with the Australian Digital Commerce Association (ADCA) to contribute the national blockchain roadmap recently announced by the Australian government. Apart from that, CEO of NEM Blockchain Center Malaysia and SEA Business Development Director, Jasmine Ng, shared in Women in Leadership Conference at Kuala Lumpur, highlighting the basics of blockchain and women leaders in NEM Foundation. She was speaking in a panel at the British Malaysian Chamber of Commerce Digital Innovation Conference and was recognised as one of 12 women leading the way in Malaysia for holding leadership positions with a track record for success on WOBB. Anton Bosenko is in charge of "Processes & General Support", and week by week has been completing assigned tasks. Additionally, he is at the forefront of the software inclusion process for Contractors. Steve Li is in charge of the generation of all the policies that will govern the Foundation, a work that is very close to completion. Dona Rinon has been working with the Finance Department, establishing the necessary processes to be able to monetize through OTC. Pedro Gutierrez is in charge (work in progress) of structuring the business development vertical, which includes migration strategies for existing clients, generation of new markets, catalog of Proof of Concepts on Catapult amongst many others. We have made progress in onboarding a software portal to onboard NEM Contractors to work with NEM Foundation as we ramp up in inviting partners to contribute to the development of Catapult as per the funding proposal to onboard contributors to the ecosystem. With the software portal, we will see more transparency, efficiency and integrity in the vendor management process towards the selection of third-party contributors. There will be a further announcement on the NEM Contractors program in our next update. As part of the initiatives of the NEM Foundation to have a more effective way of communication, we are encouraging everyone to move to the official telegram groups of NEM community. All Foundation news and updates will be announced on these channels from April 8, 2019. We appreciate your kind cooperation. If the community wishes to maintain their community channels, they will be required to be supported by interested community members, not by Foundation staff. Nice to see updates coming in consistently. Thanks Nelz for the invaluable contributions you made to Nem ecosystem. Best of luck to you, I hope you’ll still be around. To clarify the above…the NCF ceasing distribution of funds if not because of NEM Ventures nor have we vetted the current NCF projects. We have stopped new proposals entering yhe old process and have assessed the previous NCF backlog companies for invesment. However, the current NCF projects are being managed by a seperate committee which has taken this decision in the best interest of the community. We havent been involved in that decision nor are we managing those project proposals under the old scheme, as per our own proposal. Great catch. Thanks for pointing out the NEM Ventures url oversight. We’ve updated the communications.